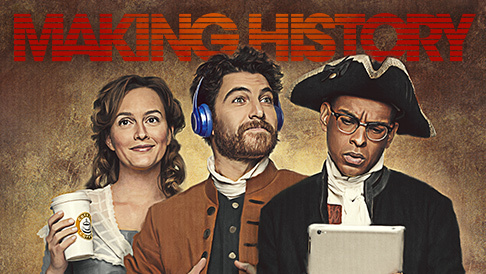 Making History is the latest Fox comedy, starring Adam Pally (Happy Endings, Mindy Project), Yassir Lester, and Leighton Meester (Gossip Girl). Taking place in current time, High School maintenance worker Dan (Pally) has a magical time traveling sleeping bag, in which he goes back in time to the 1700s and his girlfriend, Deborah Revere (Paul’s daughter) (Meester). But when his actions in the past affect current times, he needs help from History Teacher Chris (Lester) to make things right again. The past smells like poop because there is doody everywhere. They combine modern humor with historical fiction. For example, sitting in a 1770s bar with Sam Adams and he offers Chris a drink of his finest ale…after taking a sip he is informed that he really drank from the piss pail. A very fun show, with unlimited potential (thanks to the past), it gets a MUST WATCH PILOT and a 9 out of 10.